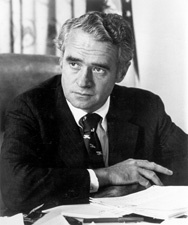 Thomas Francis Eagleton (September 4, 1929 – March 4, 2007) was a United States Senator from Missouri, serving from 1968 to 1987. He is best remembered for briefly being the Democratic vice presidential nominee under George McGovern in 1972. He suffered from bouts of depression throughout his life, resulting in several hospitalizations, which were kept secret from the public. When they were revealed, it humiliated the McGovern campaign and Eagleton was forced to quit the race. He later became adjunct professor of public affairs at Washington University in St. Louis. He was also known to have suffered from depression. Between 1960 and 1966, Eagleton checked himself into the hospital three times for physical and nervous exhaustion, receiving electroconvulsive therapy (shock therapy) twice. He later received a diagnosis of bipolar II from Dr. Frederick K. Goodwin. On April 25, 1972, George McGovern won the Massachusetts Democratic primary, and conservative journalist Robert Novak phoned Democratic politicians around the country. On April 27, 1972, Novak reported in a column his conversation with an unnamed Democratic senator about McGovern. Novak quoted the senator as saying "The people don't know McGovern is for amnesty, abortion, and legalization of pot. Once middle America — Catholic middle America, in particular — finds this out, he's dead." Because of the column McGovern became known as the candidate of "amnesty, abortion, and acid." On July 15, 2007, several months after Eagleton's death, Novak said on Meet the Press that the unnamed senator was Eagleton. Novak was accused in 1972 of manufacturing the quote, but stated that to rebut the criticism, he took Eagleton to lunch after the campaign and asked whether he could identify him as the source; the senator refused. "Oh, he had to run for re-election", said Novak, "the McGovernites would kill him if they knew he had said that." Political analyst Bob Shrum says that Eagleton would never have been selected as McGovern's running mate if it had been known at the time that Eagleton was the source of the quote. "Boy, do I wish he would have let you publish his name. Then he never would have been picked as vice president", said Shrum. "Because the two things, the two things that happened to George McGovern — two of the things that happened to him — were the label you put on him, number one, and number two, the Eagleton disaster. We had a messy convention, but he could have, I think in the end, carried eight or 10 states, remained politically viable. And Eagleton was one of the great train wrecks of all time." In 1972, Richard Nixon appeared unbeatable. When McGovern won the Democratic nomination for President, virtually all of the high-profile Democrats, including Ted Kennedy, Walter Mondale, Hubert Humphrey, Edmund Muskie, and Birch Bayh, turned down offers to run on the ticket. McGovern had been convinced that Kennedy would join the ticket. Kennedy ended up refusing. McGovern campaign manager Gary Hart suggested Boston Mayor Kevin White. McGovern called White, and received "an emphatic yes", but the leader of the Massachusetts delegation, Ken Galbraith, said the Massachusetts delegation would walk out if the announcement was made to the Convention that McGovern had chosen White as his vice-presidential candidate, as White had backed Muskie during the Massachusetts primary. Massachusetts ended up being the only state (along with the District of Columbia) that McGovern would carry in the Electoral College on election day. McGovern said he would back Eagleton "1000 percent". Subsequently, McGovern consulted confidentially with preeminent psychiatrists, including Eagleton's own doctors, who advised him that a recurrence of Eagleton's depression was possible and could endanger the country should Eagleton become president. 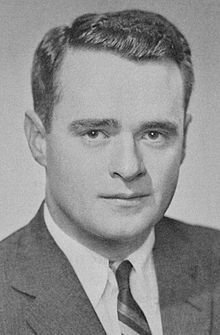 On August 1, 19 days after being nominated, Eagleton withdrew at McGovern's request and, after a new search by McGovern, was replaced by Kennedy in-law Sargent Shriver. McGovern's failure to properly vet Eagleton and his subsequent handling of the controversy gave occasion for the Republican campaign to raise serious questions about his judgment. In the general election, the Democratic ticket won only Massachusetts and the District of Columbia. Eagleton did not seek a fourth term in 1986. He was succeeded by former Republican Governor Kit Bond, who served four terms. The seat remained in Republican hands with the 2010 and 2016 elections of former U.S. Representative Roy Blunt. On July 23, 1996, Eagleton delivered a warm introductory speech for McGovern during a promotional tour for McGovern's book, Terry: My Daughter's Life-and-Death Struggle with Alcoholism, at The Library, Ltd., in St. Louis, Missouri. At that time, McGovern spoke favorably about Eagleton and reminisced about their short-lived presidential ticket in 1972. In January 2001, he joined other Missouri Democrats to oppose the nomination of former governor and senator John Ashcroft for United States Attorney General. Eagleton was quoted in the official Judiciary Committee record: "John Danforth would have been my first choice. John Ashcroft would have been my last choice." In 2005 and 2006, he co-taught a seminar on the US presidency and the Constitution with Joel Goldstein at Saint Louis University School of Law. He was also a partner in the St. Louis law firm Thompson Coburn and was a chief negotiator for a coalition of local business interests that lured the Los Angeles Rams football team to St. Louis. Eagleton authored three books on politics. Eagleton also strongly supported Democratic Senate candidate Claire McCaskill in 2006; McCaskill won, defeating incumbent Jim Talent. ^ Noble, Barnes &. "Call Me Tom: The Life of Thomas F. Eagleton". Barnes & Noble. Retrieved 3 January 2018. ^ "C0674 Eagleton, Thomas F. (1929-2007), Papers, 1944-1987" (PDF). The State Historical Society of Missouri. Retrieved 4 January 2014. ^ TV.com. "What's My Line? : EPISODE #355". TV.com. Retrieved 3 January 2018. ^ What's My Line? (8 January 2014). "What's My Line? - Mamie Van Doren; Melvyn Douglas [panel] (Mar 24, 1957)". YouTube. Retrieved 3 January 2018. ^ Clymer, Adam (5 March 2007). "Thomas F. Eagleton, 77, a Running Mate for 18 Days, Dies". The New York Times. ^ a b "St. Louis Post-Dispatch". Stltoday.com. Retrieved 3 January 2018. ^ Altman, Lawrence K. (July 23, 2012). "Hasty and Ruinous 1972 Pick Colors Today's Hunt for a No. 2". The New York Times. Retrieved June 24, 2017. ^ a b c Kraske, Steve (28 July 2007). "With another disclosure, Novak bedevils the dead". Kansas City Star. Archived from the original on 18 October 2007. ^ Ganey, Terry (19 August 2007). "A slice of history: Biographers of the late U.S. Sen. Thomas Eagleton of Missouri will find some vivid anecdotes when they comb through his large collection of journals, letters and transcripts housed in Columbia". Columbia Tribune. Archived from the original on 7 June 2013. ^ Riesel, Victor (6 July 1972). "Coalition Breaking". Rome News-Tribune. Rome, Georgia. ^ Garofoli, Joe (26 March 2008). "Obama bounces back – speech seemed to help". The San Francisco Chronicle. ^ Kohn, Edward (20 October 1980). "Eagleton's Reelection Bid Interrupted By Trial of Niece on Extortion Charge". Washington Post. ^ "Around the Nation; Convictions Upheld In Eagleton Extortion". New York Times. 15 August 1981. ^ Noble, Alice (23 October 1980). "A niece of Sen. Thomas F. Eagleton, D-Mo., testified..." UPI. ^ "Thomas F. Eagleton Scholarship - Thompson Coburn LLP". www.thompsoncoburn.com. Retrieved 3 January 2018. ^ a b "Catholic group fights church leaders on stem cell research". CNN. 5 November 2006. Archived from the original on 6 November 2006. ^ "The Record - The Source - Washington University in St. Louis". Record.wustl.edu. Retrieved 3 January 2018. ^ "Final wish: Be kind to dogs, vote Democratic". MSNBC.com. Associated Press. 10 March 2007. Retrieved 27 November 2012. Bormann, Ernest G. "The Eagleton affair: A fantasy theme analysis." Quarterly Journal of Speech 59.2 (1973): 143-159. Strout, Lawrence N. "Politics and mental illness: The campaigns of Thomas Eagleton and Lawton Chiles." Journal of American Culture 18.3 (1995): 67-73. Trent, Judith S., and Jimmie D. Trent. "The rhetoric of the challenger: George Stanley McGovern." Communication Studies 25#1 (1974): 11-18. United States Congress. "Thomas Eagleton (id: E000004)". Biographical Directory of the United States Congress. "Thomas Eagleton photographs". University of Missouri–St. Louis.